After winning his first Masters title, Sock will be making the short trip to England to compete against Roger Federer and the other six who made it from the ATP race. 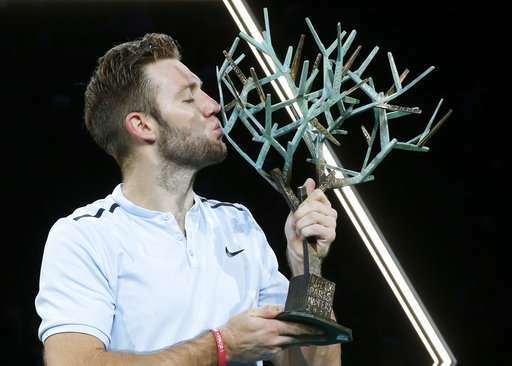 After being one game away from going home early in the tournament, Jack Sock won the Paris Masters on Sunday to qualify for the season-ending ATP Finals in London. Sock beat Filip Krajinovic 5-7, 6-4, 6-1. It is easily the biggest trophy so far in the 25-year-old American's career. Before coming to Paris the 16th-seeded Sock didn't even think of London. But after winning his first Masters title, he will be making the short trip to England to compete against Roger Federer and the other six who made it from the ATP race. "Coming in this week I had no idea I could even make London. It wasn't in my head," Sock said. "Incredible week. Hard to describe, honestly. I don't think it's really hit or soaked in yet." Especially as on Wednesday, his mind was drifting way off somewhere. Deep into the third set against Britain's Kyle Edmund — a tough opponent in the second round — Sock trailed 5-1. "I was thinking about my holidays ... I'm proud of myself for fighting and getting through," Sock said. "To come back from the deficit I was down and to have this trophy next to me now has been an incredible achievement." Fast forward to Sunday and he now walks away from Paris with a check worth nearly $1 million and a jump up the rankings to No. 9. Sock already knows how he is going to approach the finals. "I'm going to swing big and play my game like I always do," he said. "Just enjoy the moment." This was his fourth career title. He sealed victory on his first match point when Krajinovic, a Serbian qualifier ranked No. 77, sent a backhand long. Sock fell onto his back with his hands on his face, then jumped into the seating area to celebrate with his team. "I had some anxious sleep last night," Sock said. "I was able to find that groove in the second and third (sets)." He is the first American winner here since Andre Agassi in 1999; and the first American winner of a Masters tournament since Andy Roddick at Miami in 2010. "I've had a rough season pretty much since, since March," Sock said. "I just wanted to play some good tennis my last week and go start my offseason." With a wry smile, Sock said he would be celebrating with "just a water on the rocks." Krajinovic was the first qualifier in a Masters final since Jerzy Janowicz, also here, in 2012. After losing, the 25-year-old Serb sat slumped in his chair, shaking his head in disappointment. He had only played finals on the challenger circuit before, winning all five of them, and came through the qualifying rounds. He seemed to run out of energy in the third set. "I was not aggressive enough," Krajinovic said. "He started to play better and better and I didn't serve well." Still, he will climb to No. 33 next week. "From (qualifying) I beat so many good guys, a better ranking than me," Krajinovic said. "So it's all positive coming home, finally having holidays after playing so many matches this year." The first set was even, with Krajinovic looking a little sharper than Sock, who is also 25. Sock was 30-40 down in the 12th game, and Krajinovic had his first set point. He took it when Sock went for a typical cross-court winner on the forehand and whipped his shot into the net. He responded well, upping his level in the second set as the momentum started to turn. Sock secured a crucial break in the third game of the decider with a superb forehand winner on the run, and then held for 3-1. Krajinovic was reeling and dropped his next service game when Sock hit a backhand crosscourt winner that flew past his outstretched racket. He was broken again when serving to stay in the match. Sock had nine aces and broke Krajinovic's serve six times to compensate for the three times he dropped his own serve. Sock's other titles this year were at Delray Beach, Florida and Auckland, New Zealand — both on outdoor hard courts.